In the Sahel, Acacia albida used to be the best known tree for restoring and enriching agricultural lands, by increasing the soil’s organic matter, nitrogen content and water holding capacity, as well as promoting valuable microbiological activity. 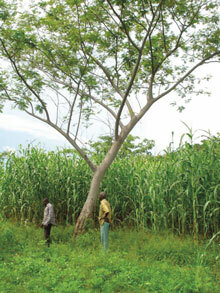 But more than ten years ago, farmers discovered new fertiliser tree species to combat soil impoverishment. In Burkina Faso, Senegal and Togo, species such as Albizia saman (rain tree) or Albizia chevalieri are covering more and more agricultural land, with promising results in terms of soil quality and yield increases. In south-western Togo, the French association for the promotion of fertiliser trees and agroforestry, L’Association pour la promotion des arbres fertilitaires et l’agroforesterie (APAF), has disseminated agroforestry practices in rural areas. The initial target was to develop 11,000 agroforestry fields and afforest 560 areas, but this was soon exceeded. As part of the Association’s support programme for agroforestry and community forestry initiatives, farmers have developed over 29,000 agroforestry fields and afforested some 2,000 areas on their farmlands.